3d motorcycle racing game. 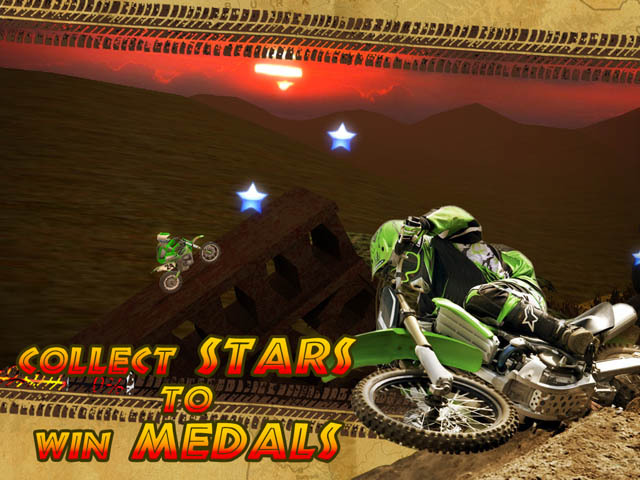 Try to collect all stars on every levels in these mad motorbike competitions. Your trialbike is equipped with nitro acceleration which will help you to jump over obstacles and platforms and to get out of pits. Collect certain number of stars to get a medal. Get some gold medals to unlock a new motorcycle. Make a back flip to get nitro. Controls: Letf Arrow - Roll Back, Right Arrow - Roll Forward, Up Arrow - Move Forward, Down Arrow - Move Backward, Left Shift - Nitro, Esc - Exit/Pause/Retry.